Eggshell and semi-gloss are two high-quality paints both worth your money. However, when faced with the decision of choosing one from the other, your choice should be based on a few different factors like what room of the house you’re planning on painting, how often you’re planning on using that room, whether you have pets, and so on. So, if you’re having a hard time deciding between eggshell and semi-gloss, take advantage of the information listed below. Eggshell paint is off-white in color and has a gloss percentage of anywhere between 10% to 25%. Once dried, you’ll notice a slight, smooth shine. Although this shine isn’t as good as some paints, the finish still looks great. The best part? Eggshell paint is a good choice for anyone who wants to hide the imperfections on their walls. An additional benefit to using eggshell white paint is that it’s quite easy to clean. All you need is a little soft soap and a damp washcloth. Dirt, filth, and grime can all be easily wiped away from the surface. You won’t have to shrub hard or with a lot of effort. Although eggshell white paint is more durable than most flat finishes, it’s not as durable as semi-gloss paints. As a result, eggshell white is a more appropriate paint for areas of your home with low traffic. These might include places like the inside of a closet, a hallway, the bedrooms, and even the ceiling. You definitely want to avoid using eggshell paint in busier areas of your home like the kitchen, the bathroom, and the living room. In addition to this, you’ll want to avoid using eggshell paint if you have kids and/or pets. Kids and pets are very active and have a tendency to slam, bump, and crash into walls resulting in consistent touch-ups. This can not only become a hassle but buying touch-up paint on a regular basis gets quite expensive too. Although eggshell paint is more durable than flat finishes, it’s just not tough enough to handle a busy household with lots of traffic. Many professional painters consider semi-gloss paint to be a step up from eggshell paint. Why? Well first, semi-gloss delivers a much more noticeable gloss finish when compared to eggshell. The difference is easy to notice and appreciate. Semi-gloss also dries harder, lasts longer, and is overall more durable than eggshell. This is why using semi-gloss in high-traffic areas of your home like the kitchen, the living room, and the dinning room is a good choice. This is also true for household with lots of children and/or pets. If you’re needing to paint your cabinets, the trim in your home, or even the doors, semi-gloss is yet again a better choice than eggshell. Like eggshell paint, semi-gloss is easy to clean. In fact, semi-gloss has been shown to be easier to clean than eggshell. This is because of the gloss. To clean semi—gloss painted surfaces, all you need is some soft soap and a damp washcloth to easily wipe away filth, crayon marks, fingerprints, splattered food, grease stains, and anything else that can dirty up the surface. It’s that easy. As great as semi-gloss is, there is one downside to using it. Semi-gloss paint will reveal any imperfections on your wall once it has fully dried. 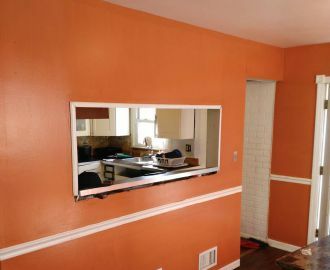 If you have a lot of dents and other deformities on your wall, semi-gloss might not be the best choice. Instead, you’ll want to choose eggshell or a flat paint. When compared to eggshell and flat, satin is most durable of the three. It’s tough, lasts a long time, and is hard to damage. In addition to this, satin is much easier to clean than both eggshell and flat paints too. In fact, flat paints are the hardest to clean of the three. Like semi-gloss, satin paints are also best used in high-traffic areas of the home in addition to homes with lots of children and/or pets whereas eggshell and flat paints are best used in low-traffic areas of the home. You’ll want to keep this in mind the next time you go shopping for paint. The only real downfall to satin is that it doesn’t hide imperfections on your wall at all. In fact, satin hides imperfections worse than just about any paint out there. 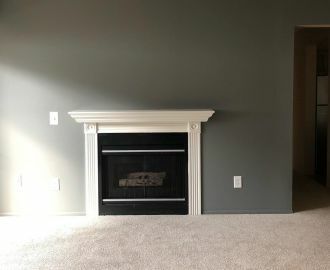 If you really want a paint that’ll hide the imperfections, then you’ll want a flat paint. Eggshell paints work too, but flat paints work the best. They are the best choice for this situation. This is because flat paints have the least gloss of the group, and as a result, those bumps, davits, dents, and cracks will blend right in once the paint fully dries.